In a game that was not as close as the final score would indicate, the Memphis Blues Queen B defensive unit simply dominated the game. They would intercept Carlie McCall three times in the first half and managed to hold the Gals to just three points at the break. The Blues' offense recovered after an opening miscue and would find the endzone on 6 of their next 8 possessions. Halfway through the fourth quarter Memphis pulled all of their starters and the Gals scored on their next 2 possessions. The lone bright spot for Kalamazoo's defense came when Lineman of the Year award winner, Delonda Cross, tipped and intercepted a pass thrown by Memphis backup QB Arianna Hubbard. Cross returned the interception for a touchdown. It was the last score of the game. Rebecca Calhoun's five touchdown pass performance won her Finals MVP. With the 2011 Jefferson-Hodge Cup Final in the books, teams look ahead to the 2012 season. The 2012 off-season began almost immediately after the 2011 postseason ended. Just one week after Memphis' win over Kalamazoo, the GLA unveiled a new logo in an effort to improve brand recognition and marketability. The Unveil would be the first of a league-wide rebranding that would include a name change for one team and the relocation of another. I'm not completely sold on the way I originally posted the logo so I'm looking for suggestions. I have few variations here, which one is the better option for a re-brand? I threw in a couple of non red-white-blue options, too. Let me know what you think! The purple and teal is unique and stands out next to the other options to me. If you're set on the RWB option, the blue with red outline and football is the best in my opinion. The all orange one reminds me of the WNBA logo, but I do quite like the purple and teal look. My personal favourite in the RWB options would be the blue with blue outline and red ball, but the blue with red outline and ball is not too bad. ...which purple and teal? I personally am a fan of the darker purple, but the lady likes the original. I have one, the other, and combinations of the two. Middle row, on the right. Logo #1, 2, 5 and 6 are my favourites colour wise so any one of those four I'd like to see. I think we have a winner here. Thanks everyone for your responses and suggestions! Among the changes for the 2012 season, the first was the league's overhaul of its identity. PlayGLA.com, the league's official website, noted that, "the new logo better represents who we are and what we're trying to accomplish." None of the elements from the previous logo were carried over, instead the league wanted a logo that was "unique to the GLA." The shape of the shield, the silhouette of a player running with the ball, and the colors were all reportedly chosen with that goal in mind. The league also unveiled logos for their newly created Northern and Southern conferences. New look for Columbus. I tried to incorporate the Spirit of Columbus, the plane after which the team is named, into the logo this time around instead of going with generic flight. Unis to come soon! I'm not really sold on the woodmark, though. Does it work with the logo? The Spirit have also become my first RWB team. I change the red a bit, kept the white, swapped the black for a navy blue and added a silvery gray. Red is still the dominant color for the team and both the navy and gray will be used sparingly for the jerseys and any promotional material. I kept looking at it and kept finding things about it that I didn't like, so I went and updated it again. I think this one is better and more along the line of what I was going for. I'll get to the unis now that I'm not obsessing over this anymore. And by get to the unis I meant redesign the Defenders. I went with a more military insignia style than the old, "slap some letters onto a vaguely fort shape. Kept the fort shape and drew some inspiration from the Indiana Army National Guard insignia and heraldry. Kept the colors the same, though. Going to get some more work out as soon as I figure out why my uni template keeps crashing. After a lengthy battle with the CHL's Dayton Gems over the rights to the name (the teams were created in the same year and announced days apart) team owner Peter Stauffer, who wasn't very happy with the name anyway, agreed to change the name of the GLA franchise. Stauffer and the GLA settled on the Gem City Diamonds and simply rotated the logo and removed the black outline. 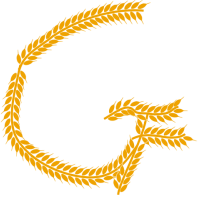 The secondary logo, the old "D-gem" with an altered version of the new woodmark below, would only be used for pre-season merchandise and always be accompanied by the new logo. I really quite like Fort Wayne's new logo, its a real improvement over the old one. For the Diamonds, I feel like it would make more sense for the main colour of the team to be some sort of blue? Considering diamonds are generally white and are often coloured blue in the style of the team's logo. I'm also not really sold on the Gem City secondary/tertiary logo, the large G and Y look out of place to me. I think you're right on all accounts here. I really want to keep the green, so I'll see if I can get it to work as maybe an accent color, but I think a color change has to happen. Either way a rework is coming and I think I'm just going to drop the secondary. It's not needed at all and I didn't really like it to begin with.